San José, Ibiza. Country, All year round, San José, 4-5 Stars. 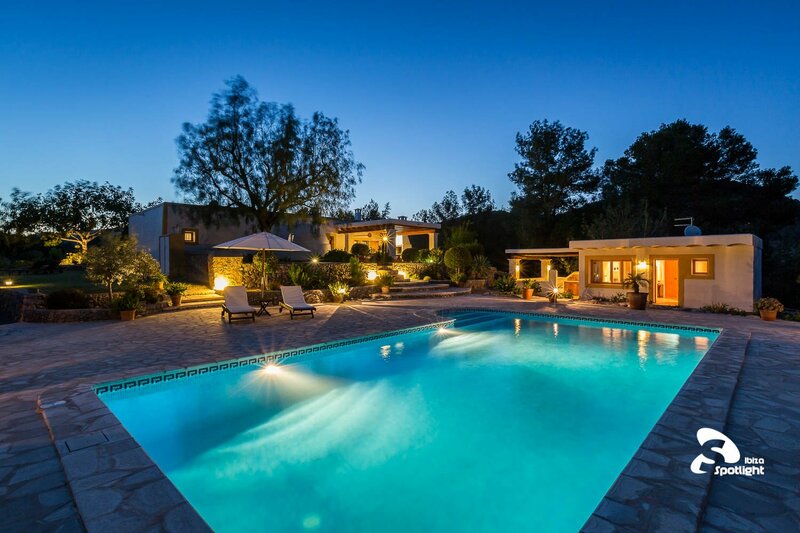 Sleeps up to 6 or 8 people - Stunning rustic villa with separate annexe and all amenities, with beautiful beaches nearby and only 7 km to Ibiza Town. Country villa close to Cala Jondal - sleeps up to 6 or 8 people. A stylish and rustic Ibicenco finca, set in a pine forest. The house's decor retains its finca style with sweet smelling Juniper-wood-beamed ceilings, traditional and antique furnishing and fabrics in soft shades. All rooms are bright and airy with thick stone outside walls that help keep out the heat of the summer sun. There is a very well-equipped kitchen that leads into the cool lounge area which in turn leads onto each of the 3 double bedrooms located in the main house. Two of the bedrooms have en-suite bathrooms and there is another separate bathroom. If also hiring the independent annexe by the pool, you can add another double bedroom with an en-suite, meaning you can sleep up to 8 people in the entire villa. This private villa has been fully modernised with cool creature comforts like plasma Sat TVs, universal mobile phone docking stations as well cas air-con in every bedroom. Stepping out from the kitchen you will come to the terrace where you can spend a languid evening cooking on the barbecue and enjoying the peace. The pool area invites you to take a dip or you can relax in the romantic chill out area. There is also a shaded sitting area with a mini-bar, where you can kick back with a glass of wine and a good book or enjoy playing your favourite tunes on the BOSE sound system. A surrounding fence guarantees security, plus there is a lovely garden and ample parking space. This villa is ideal for groups of friends who are looking for a place that is well located, provides complete privacy and lots of mod cons. The villa's location means you have very fast access to the airport, Ibiza town and San José. On your way to Ibiza town lies Sant Jordi offering shops, supermarkets and many good restaurants. The villa is also very close to the glamorous 'A' list beach of Cala Jondal, where you will find iconic venues like Tropicana and Blue Marlin. The pretty Sa Caleta beach with its deep red cliffs is just a short drive away, where you visit ancient Phoenician ruins or try one of the excellent fish dishes in the beach restaurant there. Arrival day is a Saturday (7-night minimum stay/pay requirement from June to September). In high season only the 4 bedroom option is available. The annexe can not be rented separately. Despite its proximity to the airport, there is no noise from planes.